Valves may be flat, or may have a convex or concave center. Valves have a distinct central area with a stellate or “floral” pattern of elongate or puncta-like areolae. 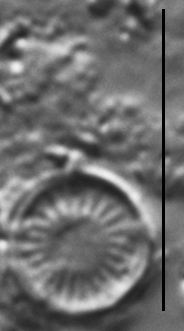 The central area is surrounded by a marginal ring of radiate striae. The radiate striae may be bifurcated by ribs, or may have an irregular radiate pattern due to insertion of shorter striae near the valve margin. 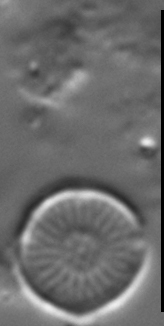 The marginal fultoportulae have expanded, hood-like external projections. These structures may be spaced on every 3 to 7 ribs. The marginal fultoportulae are best observed by fine focusing (optically dissecting) the valve. 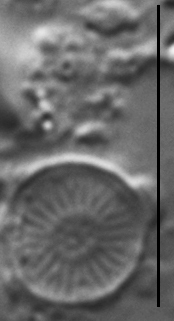 The central stellate areolae may not be present on all specimens; specimens with such morphology are sometimes referred to Discostella woltereckii Hustedt (Belcher et al. 1966). This species is of wide-spread occurrence and is common in the summer plankton nutrient-rich of midwestern streams. 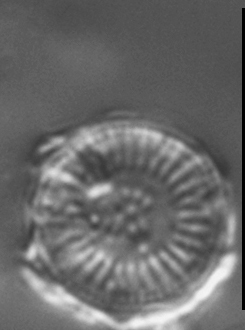 Cyclotella pseudostelligera nov. spec. Schalen kreisrund, 7-8 µ im Durchmesser, nur wenig konzentrisch gewellt, fast flach. 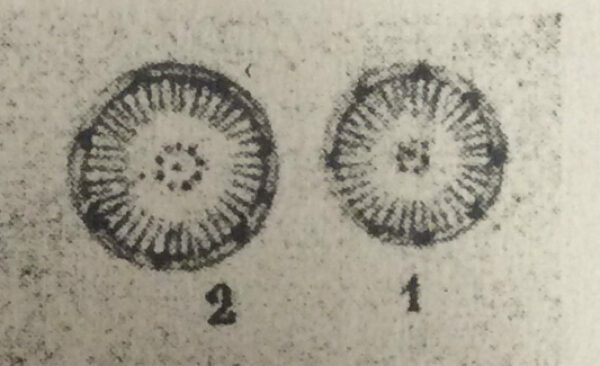 Mittlefeld 1/2 des Schalendurchmessers, mit einem zentralen Ring winziger Punkte oder kurzer Striche und einem isolierten Punkt in der Mitte dieses Ringes. Randzone zart radial gestreift, Streifen etwa 18 in 10 µ, ohne Höcker oder stärkere Rippen, aber innerhalb des Schalenrand des mit einem Kranz auffallend kräftiger Dornen. Fig. 1, 2. Collins, G.B. and Kalinsky, R.G. (1977) Studies on Ohio diatoms. Bulletin of the Ohio Biological Survey, New Series 5(3). 76 pp. 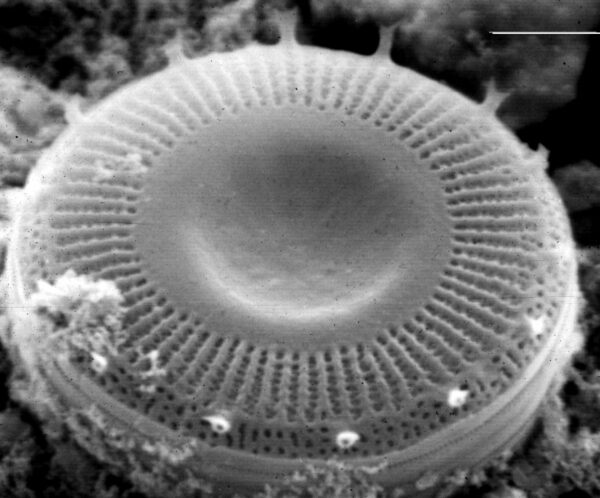 Houk, V., Klee, R. and Tanaka, H. (2010) Atlas of freshwater centric diatoms with a brief key and descriptions, Part III. 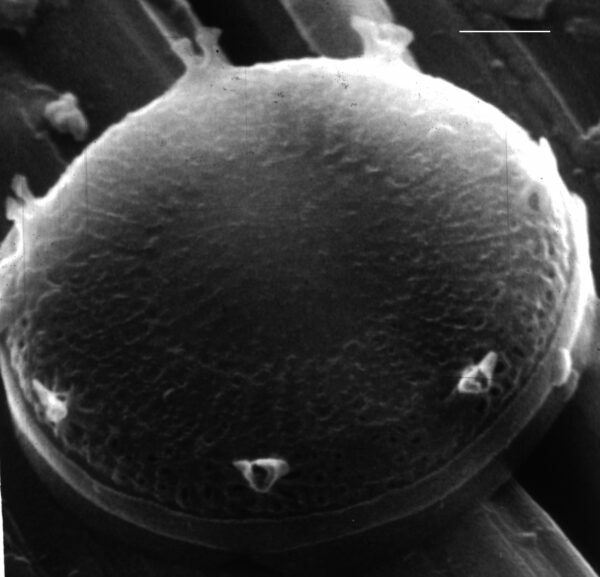 Stephanodiscaceae A. Cyclotella, Tertiarius, Discostella Fottea 10 (Supplement): 1-498. Reavie, E.D. 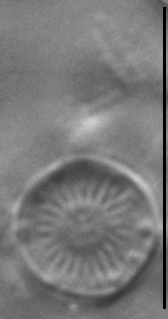 and Smol, J.P. (1998) Freshwater diatoms from the St. Lawrence River. Bibliotheca Diatomologica Band 41. J. Cramer, Berlin. 137 pp. 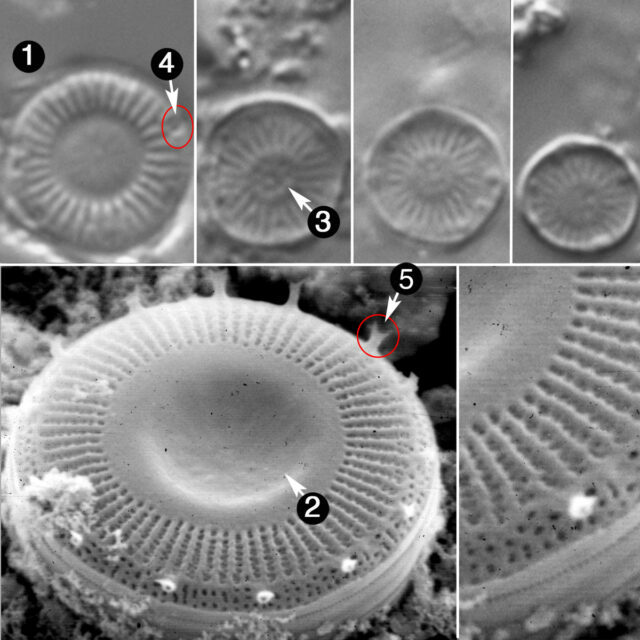 Tuji, A. and Williams, D. (2006) The Identity of Cyclotella glomerata Bachmann and Discostella nipponica (Skvortzov) Tuji et Williams comb. et stat. nov. (Bacillariophyceae) from Lake Kizaki, Japan. Bulletin of the National Science Museum Tokyo, Series B, 32(1), pp. 9–14. 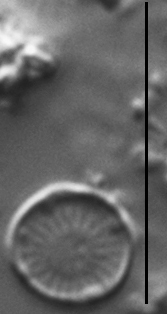 Valves are extremely small, less than 10 µm in diameter. The central valve may be flat, concave or convex. Ornamentation in the central valve may be absent, or there may be a stellate ornamentation. Marginal fultoportulae are evident in LM. 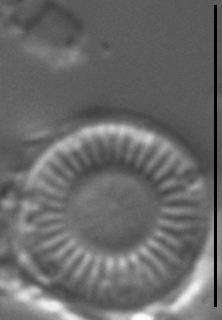 These fultoportulae may possess externally projecting tubes and/or hoods.